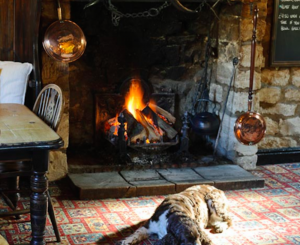 Well, the sun might be out but it's still pretty parky out there....which is why we’ve poked our noses out the door to find the warmest, cosiest pubs to snuggle up in and wait for spring. It's still pretty parky out there! Which is why we’ve poked our noses out the door to find the warmest, cosiest pubs to snuggle up in. A stone throw’s from Princess Anne’s gaff Gatcombe Park, this old-school pub is a proper rural charmer. Despite its proximity to royalty, there are no airs and graces here and everyone is welcome – walkers (don’t worry about muddy boots, they’re used to that), kids (positively embraced) and dogs (muddy paws also not a problem). 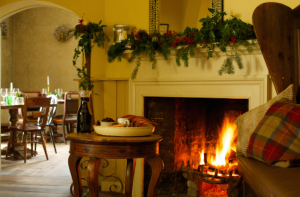 It’s a place to pull up a chair next to the open fire, sink a pint of local real ale and hunker down. And if you’re hungry, they serve the most amazing pies. Seriously, you’ll be going crazy on Instagram with them. A former, 17th-century coaching inn, The Old Crown Inn is über-friendly, unpretentious and the perfect place to flop after a (not too long) walk up to Uley Bury, a prehistoric Iron Age hill fort ten minutes from the pub – gorgeous views up here people, you’ll be wanting panorama mode on your camera. The Crown’s relaxed surroundings, open fire and solid pub grub at very reasonable prices are its hard-to-resist USPs. And if you have a penchant for real ale, pies and steamed puddings, you’ll be in the right place. Jilly Cooper’s local is cosy pub incarnate and has been warming drinkers’ cockles since 1639. Yes, it’s that old! It moved into its current premises in 1766 – before that the building was the court house and if you look across the road you’ll see a couple of outdoor cells which aren’t so cosy, so mind your p’s and q’s. Indoors, though, you can snuggle up in high-backed settles that feel like they’re giving you a hug, be warmed by the fire and soak up the atmosphere – regular drinkers always keep the pub humming. There’s great food – a new chef has recently joined with a modern menu up his sleeve – and plenty to whet your whistle with. This good-looking, 18th-century pub on the edge of the Bathurst Estate has a laid-back, youthful vibe thanks to the students from the nearby Royal Agricultural College who flock here. (No bad thing in my view – makes me feel vicariously young again!) 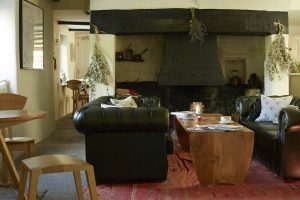 There’s a roaring fire with sofas to slump into, cosy corners where you can nosh on pub classics, a kid-friendly restaurant area and, when the weather does finally warm up, a large garden with far-reaching rural views. You don’t just get cosy in the countryside! 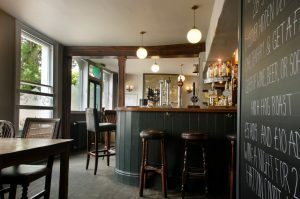 Hiding in a back street of Cheltenham’s haute ‘hood Montpellier, The Beehive’s traditional charms, real ales, superlative food and buzzy vibe make it a favourite among those in the know. Have a peak upstairs while you’re there – the Supper Room with its 20ft ceiling, cast-iron chandelier and minstrel gallery is the perfect place to eat come evening and can also be hired out privately. 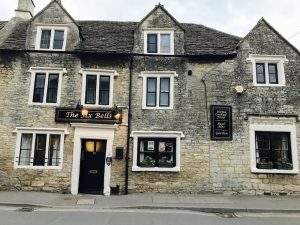 Low ceilings, beams, timber supports, warm Cotswold stone, roaring fires and a picturesque setting in the ur Cotswold village of Chipping Campden means the Eight Bells Inn is ticking all the cosy pub boxes. It was built in the 14th century and gets its name from the eight bells from the church tower that were stored there. You’re near Hidcote and Batsford Arboretum here so it’s a good day tripper pit stop. Nosh is seasonal and delicious, and the local ale runs freely. 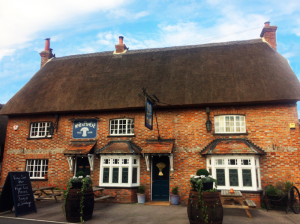 This award-winning pub is a perfectly cosy blend of traditional 18th century architecture and stylish, modern interior design – just what we like at Muddy. 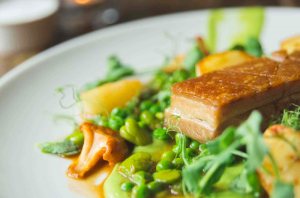 Huddled in the picturesque village of Swallowcliffe, the food is seasonal (obvs) and inventive – try the beetroot and vodka cured salmon or fillet of curried cod, plus they do a fab Sunday roast and Friday fish and chips. It’s got some pretty smart rooms too, so you can have your fill and then stagger up to bed. A corker of a cosy country pub, The Wheatsheaf is bang on for winter warmers such as wood fired pizzas, mac n’ cheese and hearty pies. In their own words, this little slice of foodie heaven serves upmarket peasant food – translate that as unpretentious, affordable and choc-full of flavour. Interiors are snuggly yet funky, there’s often live music on a Friday night and if you’ve got the energy to waddle upstairs, there’s a pretty cool vintage boutique lurking above. Plus, most of the food is local, organic and sustainable, so right up our Muddy street. The Three Tuns is one of those rare beauties – it has a lovely, dog-friendly beer garden with a boules pitch for summer-tastic drinking but come winter, roaring fires will toast your toes while you glug your way through the jug of freshly-made Bloody Mary propped on the bar, small batch spirits from around the Southwest and, last but not not least, their homemade Mulled Cider. 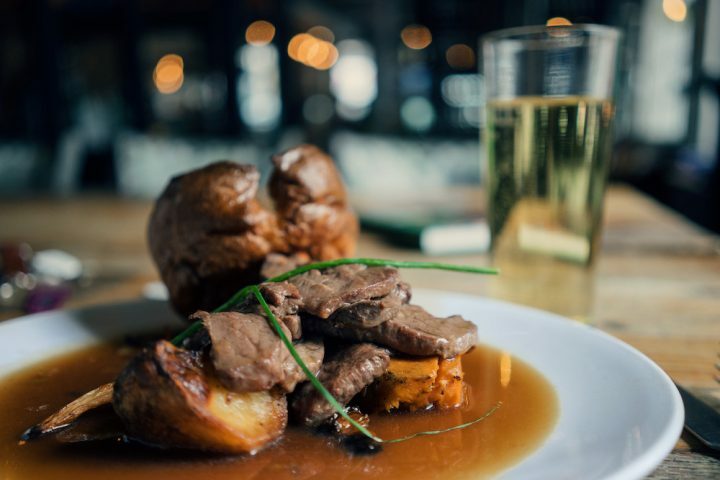 It has won accolades for Best Sunday Roast EVER and Favourite Local Pub, so it’s no surprise that great food is a biggie here, from small bites of cauliflower cheese croquettes to rare Bavette steak. 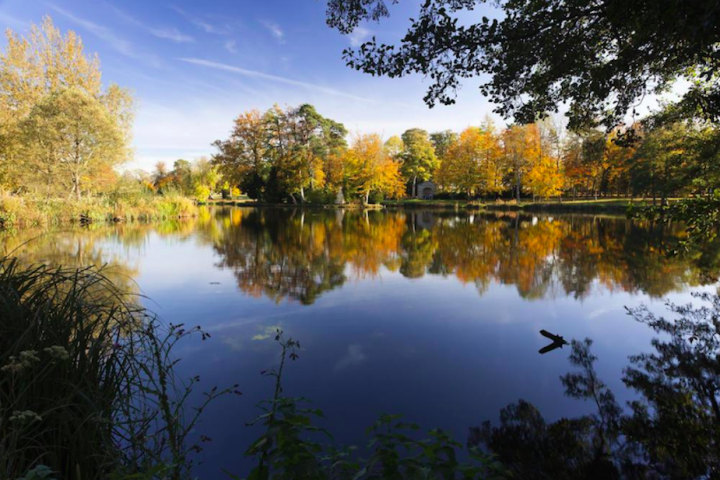 A great place to hop on to the Kennet and Avon Canal or Savernake Forest after Sunday lunch. Just had the Mudlets dragging you around Longleat? Suffered enough of monkeys pooing on the car? Then you need to hot-foot it to The Bath Arms, a properly cosy hideaway tucked in the shadow of the safari park, the perfect place to relax and unwind. It’s a foodie pub but is also a lovely boutique retreat, and the 17 cosy and characterful rooms with furniture imported from India are a quirky twist on your typical country pub. The food is locally sourced and seasonal wherever possible – you can even hire their Shepherd Room for private dining for up to 80 guests. A warm and welcoming gaff serving great food nestled in the middle of the beautiful village of Colerne in deepest Wilts – you can’t get cosier than that. With produce from local suppliers their menu is always fresh and seasonal – think slow cooked pork belly, butternut squash risotto and paprika battered squid – and they do a pretty impressive brekkie too, to mop up the night before. Formerly an old mill serving drinks through the front window to passing carriages (I like their style) The Vine Tree nestles in a tiny picturesque hamlet on the edge of The Cotswolds. It has a warm, inviting atmosphere with bags of character, flagstone floors, a wealth of old beams and a large open fire in the central bar. If you’re lucky you might spot a ghost or two – a small boy in polo kit and an old lady seem to be the most frequent apparitions spotted. Fish and seafood is whisked up from the coast and game comes from nearby estates. Oh, and they have over 50 gins at last count. This small country inn, set at the edge of the idyllic village of Broad Hinton, is nestled in rolling hills and is an ideal spot for those who enjoy great food, real ales and top notch wines. 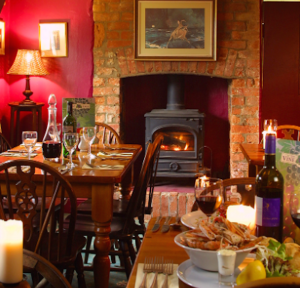 Sister pub of The Vine Tree in Norton, you’ll get the same friendly welcome and equally fab food. Go for their Sharing Feasting Menu and snaffle an entire suckling pig with your mates, followed by Alex’s Rhubarb Crumble with fruit from local allotments.